Caroline Levine (Editor), Mario Ortiz-Robles (Editor). Narrative Middles: Navigating the Nineteenth-Century Novel. Ohio State University Press, 2011. Narrative theorists have lavished attention on beginnings and endings, but they have too often neglected the middle of narratives. 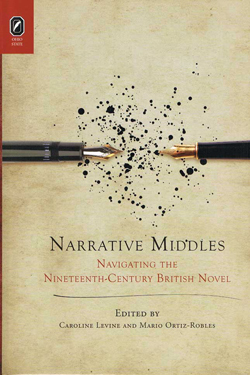 In this groundbreaking collection of essays, Narrative Middles: Navigating the Nineteenth-Century British Novel, nine literary scholars offer innovative approaches to the study of the underrepresented middle of the vast, bulky nineteenth-century multiplot novel. Combining rigorous formal analysis with established sociohistorical methods, these essays seek to account for the various ways in which the novel gave shape to British culture’s powerful obsession with middles. The capacious middle of the nineteenth-century novel provides ample room for intricately woven plots and the development of complex character systems, but it also becomes a medium for capturing, consecrating, and cultivating the middle class and its middling, middlebrow tastes as well as its mediating global role in empire. Narrative Middles explores these fascinating conjunctions in new readings of novels by Jane Austen, William Makepeace Thackeray, Anne Brontë, George Eliot, Charles Dickens, Wilkie Collins, Henry James, and William Morris. Contributors: Amanda Claybaugh, Suzanne Daly, Amanpal Garcha, Amy King, Caroline Levine, Mario Ortiz-Robles, Kent Puckett, Hilary Schor, and Alex Woloch.